Development of JSON-LD began in 2010 and in January 2014 adoption of the first version was published in documents. For the web publishing industry, embedding JSON data into HTML is interesting because it so the associated with simple usage of toolkit to retrieve data from databases. The developers tried to orient it as JSON is been used for data exchange. This is the conversion of software from JSON to JSON-LD intended to be as simple as possible. JSON-LD behaves similar to JSON, HTML + RDFa, HTML Microdata or a micro format, programs which uses the conventional JSON are practically not affected by the extension to JSON-LD. At the same time it also allows for the enrichment (to become machine-interpretable), importance stands as the other method for semantic annotation. However, the traditional of use of JSON is not the interface between man and machine, but the machine between each other. The separation of (typographic) markup and semantic data can even represent a simplification. JSON replaced XML off to XHTML. XML – Parser, RDF storage and SPARQL – are sometimes referred to as “overhead perceived in the Web environment”. Even handy formats from the RDF environment are hardly used as a base format in web protocols. JSON-LD is intended to solve the problems that could not be resolved with the other formats. Regarding the syntax of JSON applies – each JSON-LD-text is a valid JSON text (according to RFC 4627 ). Representing JSON texts conversely valid JSON-LD, the subject is mainly the first document. A JSON-LD-text must include a JSON object or a JSON array of such objects while newer versions of JSON and JSON parser also allow other JSON values ‹. All names and key the name-value pairs must be unique per object. It must also be dispensed with the empty string as a name, because not all JSON implementations can handle this. 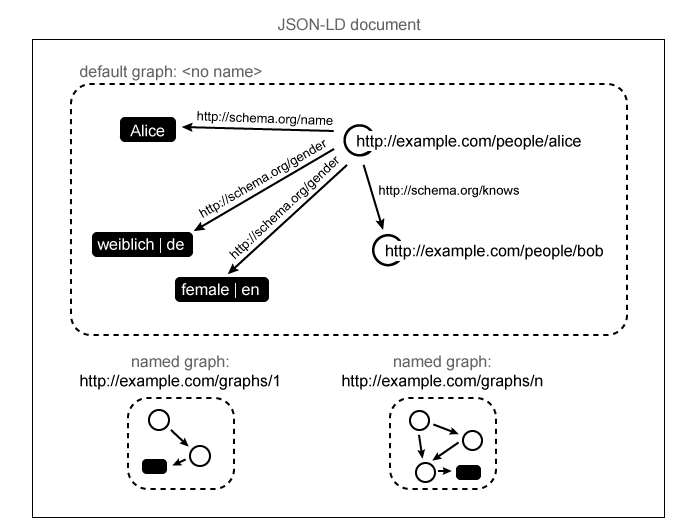 All other syntax elements of JSON-LD can be realized via special JSON strings (called keywords ) that contains the character @ and thirteen previously (context,id,value,language, @ type,container,list,set,reverse,Index,Base,vocal,graph) known keywords. Particular importance is the “:” character string to predict the location (thus context-dependent than compact IRIs can be interpreted as an absolute IRI or as long as a custom definition for the string as a whole, this does not override). In principle, the order of the pairs does not matter. Based on this, grammar includes various types of JSON objects (node ‹‹object, object value, object list, set object, language map, index map and context definition). The basic and advanced concepts of JSON-LD in non-normative sections introduced by means of examples. The most formal definition consists of about eighty normative sentences in English. As for the vocabularies, we can use FOAF, Schema.org. This Article Has Been Shared 6073 Times! YouTube Cosmic Panda is a new thought from Google for giving the users a New Experience for Videos, Playlists, and Channels. YouTube Cosmic Panda has minimalistic design some what in the Google Plus line. Google Translator Bengali Language Alpha is Available now. Like other Languages, now Bengali – the sixth most spoken Language in the World can be shared easily. Cite this article as: Abhishek Ghosh, "JSON-LD in Details," in The Customize Windows, August 29, 2014, April 21, 2019, https://thecustomizewindows.com/2014/08/json-ld-details/.